Ross Oliphant (33), who specialises in corporate and personal taxation, takes up his position within the Glenrothes office this week, one year after the firm merged with former Fife firm Carters. Born and bred in Fife, and having spent most of his career in Dunfermline, Ross joins the firm from Thomson Cooper. 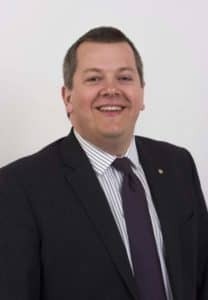 He undertook his examinations with the Association of Chartered Certified Accountants, qualifying nine years ago, and became a member of the Chartered Institute of Taxation (CIOT) in 2013. His CIOT qualification is the Gold Standard in tax qualifications, allowing him to offer the highest level of expertise to clients in all aspects of tax planning. Ross is a married father-of-one, and lives in Dalgety Bay, Fife. A keen golfer, he is also Treasurer of Dunfermline Round Table. With offices in Cupar, Dundee, Forfar and Glenrothes, EQ employs over 100 staff, and has 15 Partners. With plans to grow further and recruit into a range of positions within the months ahead, the merger last year has increased EQ’s turnover from £4M to over £6.5M within the first 12 months. For more information, visit http://www.eqaccountants.co.uk/.